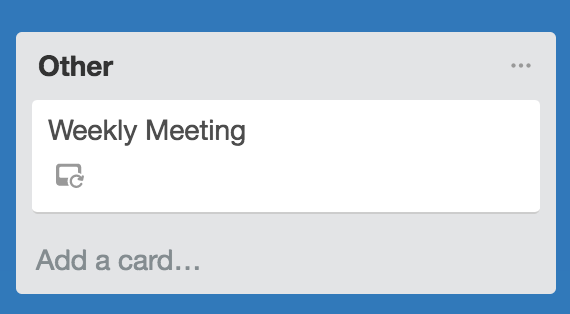 The Card Repeater Power-Up lets you copy a card every day, week, month or year, so you can get recurring tasks out of your head and onto your boards. 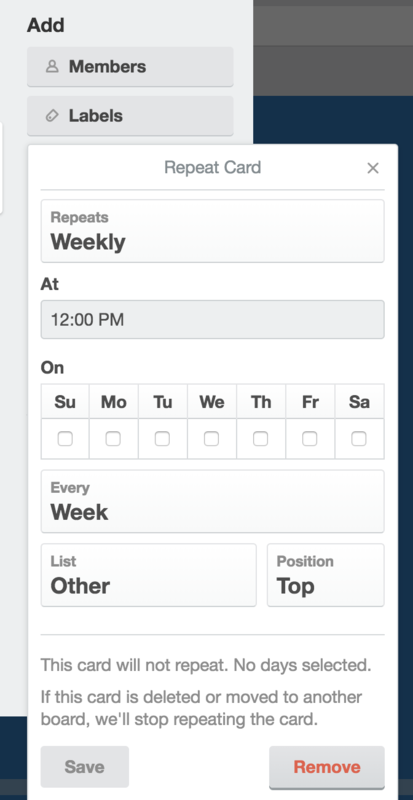 For ideas about tasks to repeat, check out the Card Repeater blog post. 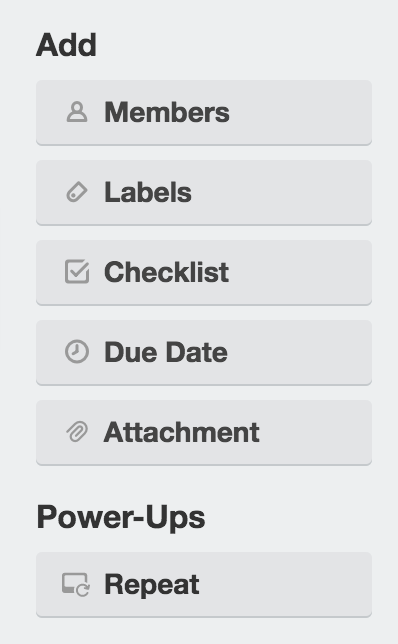 To enable the Power-Up, open the board menu on the right side of the page, select the Power-Ups menu option, and then click the "enable" button next to the Card Repeater Power-Up. Once the the Power-Up is enabled, “Repeat” will show up as an option on the back of cards. Once a card has repeating enabled, the “Next Repeat” date will show up on the card back. You can click the date to bring up the card repeater pop-up. An icon will also show up on the card front. Comments and descriptions on a card will also be repeated. Archiving the card will not stop it from repeating. 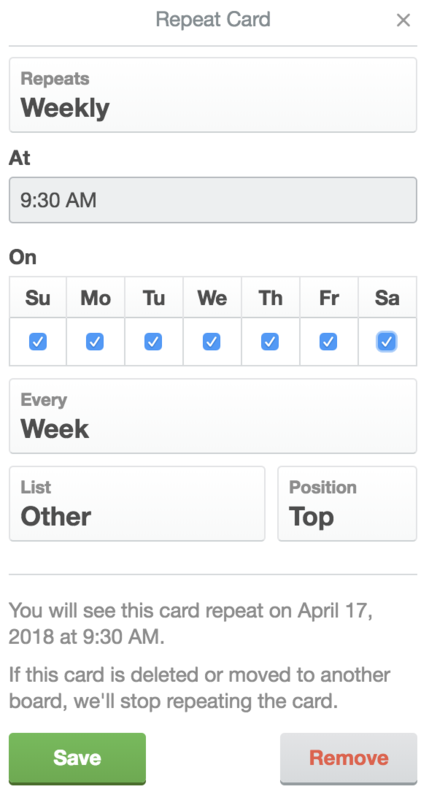 Only deleting a card, moving it to another board, or canceling the repeat on the original card will stop it from repeating. If you have a copied version of the original card, you can track down the original from the activity of the copied card. The card will be created as a “copied” event, and clicking the title of the “copied from” card will bring you to the original card. 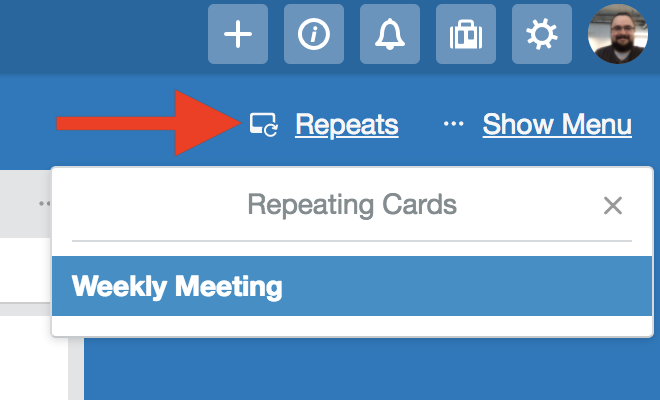 Alternately, you can click on "Repeats" in the top right of your board which will allow you to directly open the repeating card. You can disable the Card Repeater on a board by opening the Power-Ups menu and selecting the Disable button. While cards will no longer repeat with the Power-Up disabled, ‘repeats’ will be saved in case you re-enable the Power-Up.